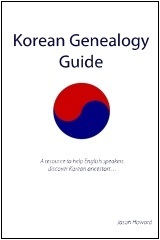 The printed version of the Korean Genealogy Guide book is available at https://www.createspace.com/3827253! It is also available from Amazon.com at http://www.amazon.com/Korean-Genealogy-Guide-resource-ancestors/dp/1475050151. This guide will help you read Korean (HanGul and HanJa), find Korean ancestors, and interpret Korean genealogical records, including family registry images from the genealogical archives at familysearch.org. The author is making an electronic version of the Korean Genealogy Guide book available for free for personal use. Please note that it is copyrighted material and should not be published without the author’s permission. It is the author’s hope that this will help those interested in discovering Korean ancestors. You can access the searchable online version at: Korean Genealogy Guide (online webpage version). The online version of the book has been restored… back by popular demand. For those who would like a Kindle version of the book, I looked into it but have ruled it out. Unfortunately, publishing thru that channel would require me to stop publishing the book or any of its contents thru any other electronic method. I did not sign up for that because I want to continue to offer the free electronic version of this book (in pdf format) via this website. That way far more people can have access to the information needed to begin searching for Korean ancestors. Kindle users can, however, view the HTLM or PDF versions of the book even if the official Kindle version is not available. This is very unique geneology where one can see their family ancestory and origin. i just want to know that how can it be useful as a historical resource of the nation. In the case of Korea, some of these records go back to 67 BC. They list who the Kings are as part of the dates. When you combine many family genealogies together and they all validate the same dates for the reigns of kings, the genealogies become a very valuable way to confirm the dates and geographic span of the reigns of ancient kings. Hello everyone. I am wanting to help my boyfriend find more of his mothers family from S Korea. His mother passed away in 2012, and he has this part of him that he feels is empty and he is wanting to know about his grandparents and cousin, anyone he might be able to reach. What would be a good place to start? Here or somewhere else? Thank you.